Want to eat Polish but vegan? Here's a decidedly Polish selection from a new cookbook all about delicious vegan cooking. The new book Pyszności z Roślin (Delectables from Plants) by Paweł Ochman is currently unavailable in English, so we thought we’d translate the most important recipes into English – the ones that are 100% Polish food! Below you'll find eight scrumptious and surprising plant-based recipes that take on traditional Polish food, all narrated by the author of the book himself. These biscuits are part of my memories from every holiday at my family’s place in Kłoczew. We baked them on huge trays, which were later taken to the bakery. We made hundreds of them. They were delicious, crispy, and buttery. My goal was to make a vegan version. It wasn’t difficult. The recipe wouldn’t appear here without the help of my friend Grażynka. She lent me her processor along with the attachment for shaping the biscuits. I am thankful for the gift. I recommend you search your family’s cupboards and attics. Put flour, starch, baking powder, and sugar in a bowl. Mix together. Add coconut oil and coconut cream and blend. Cut with a knife or mixer paddles. Knead the dough. It should be soft and elastic. Put the dough into the machine and form into biscuits of any shape. Put them on a baking tray and let them cool for 15 minutes in the refrigerator. Bake for 15 minutes at 190°C/375°F (until light brown). Some love them, some hate them. You can hear horror stories about the process of making them, but are they true? 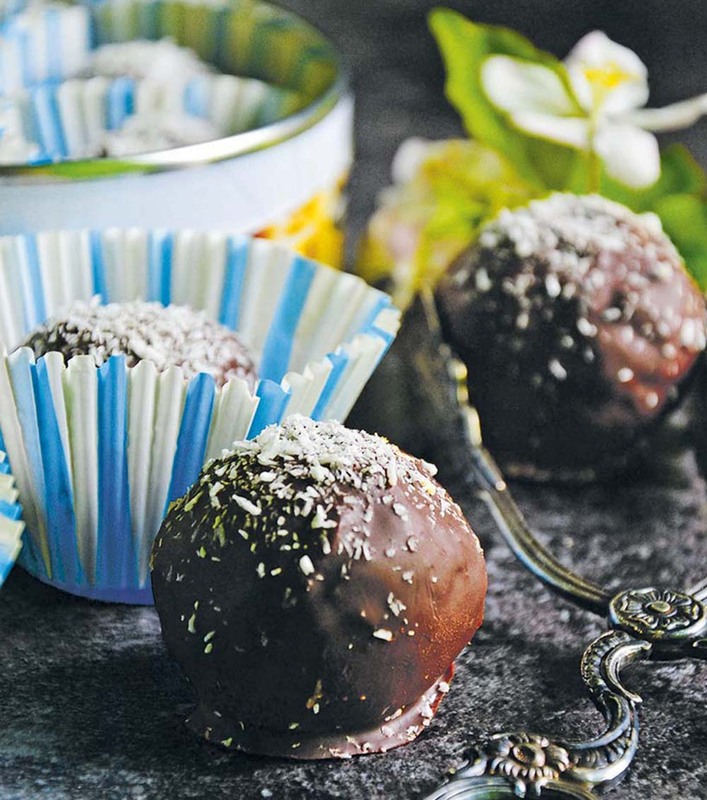 It probably depends on the recipe but they are generally a kind of leftover sweet. I make them, too. I use leftover muffins, truffles, brownies, etc. 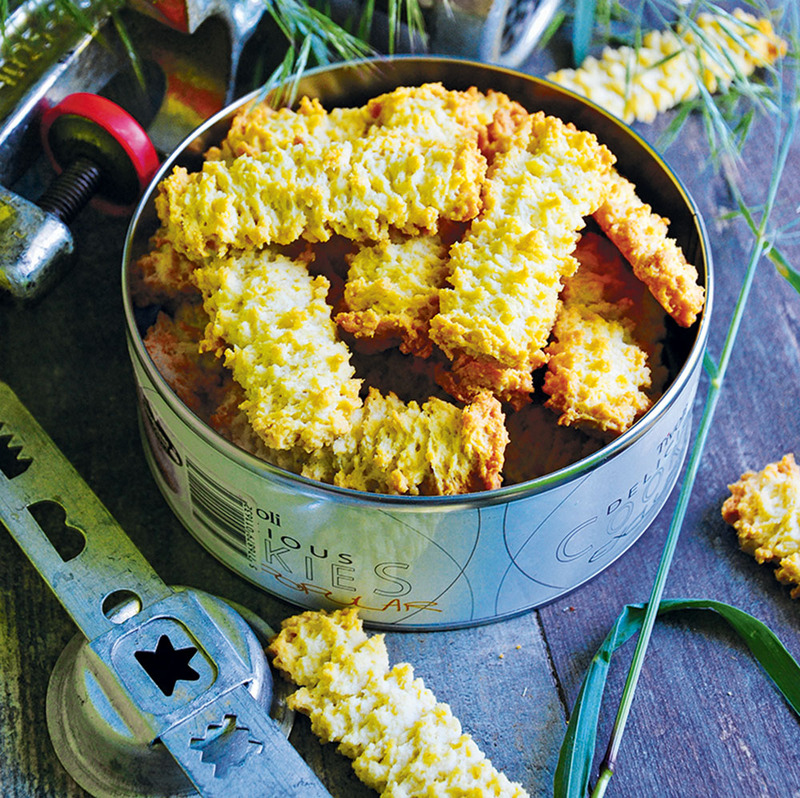 I mix them with shredded coconut, nuts, biscuits – there’s a lot of freedom here. Something with a distinct flavour is a must – lemon juice or flavoured alcohol for an adult version. You can buy them in shops in the form of a square on shortcrust pastry or as rather big balls covered with chocolate. That’s how I like them best. Crush the biscuits carefully with your hands to make a homogenous mixture. Add nuts, coconut, lemon juice and zest, raisins, alcohol, and jam to make a clay-like dense mix similar to truffle mixture. Put in the refrigerator for 1 hour. Then make balls the size of a big walnut or bigger. Put them on baking paper. Melt the chocolate and coconut oil in a water bath. Put the balls in the icing one by one. Turn them over with a fork and move onto baking paper. Put the balls in a refrigerator for 2 hours until the icing sets. • The best alcohol to add is sour cherry vodka or rum. 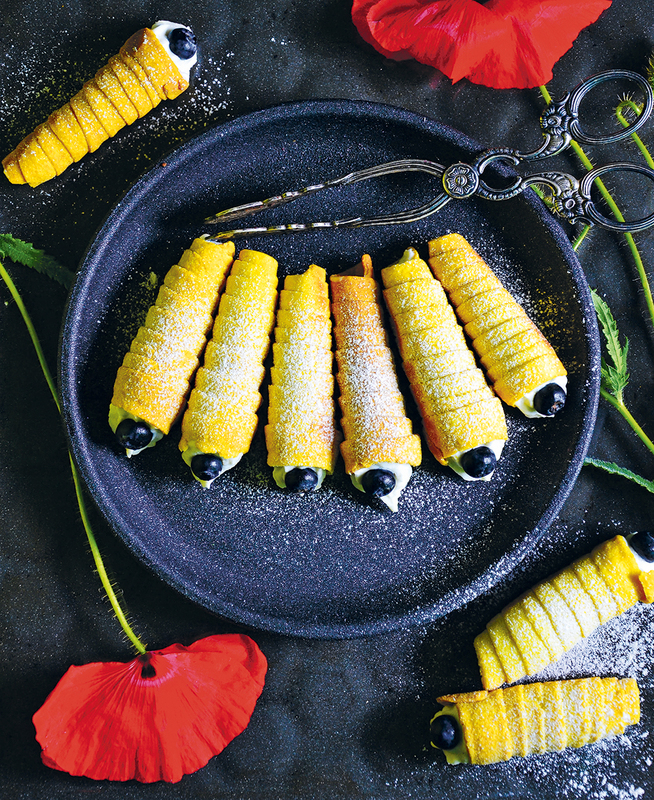 • After covering the bajaderki with chocolate you can sprinkle them with shredded coconut or finely chopped nuts. • They look best served in little paper cups. There are households where mazurek isn’t made for Easter, but mine is not one of them. 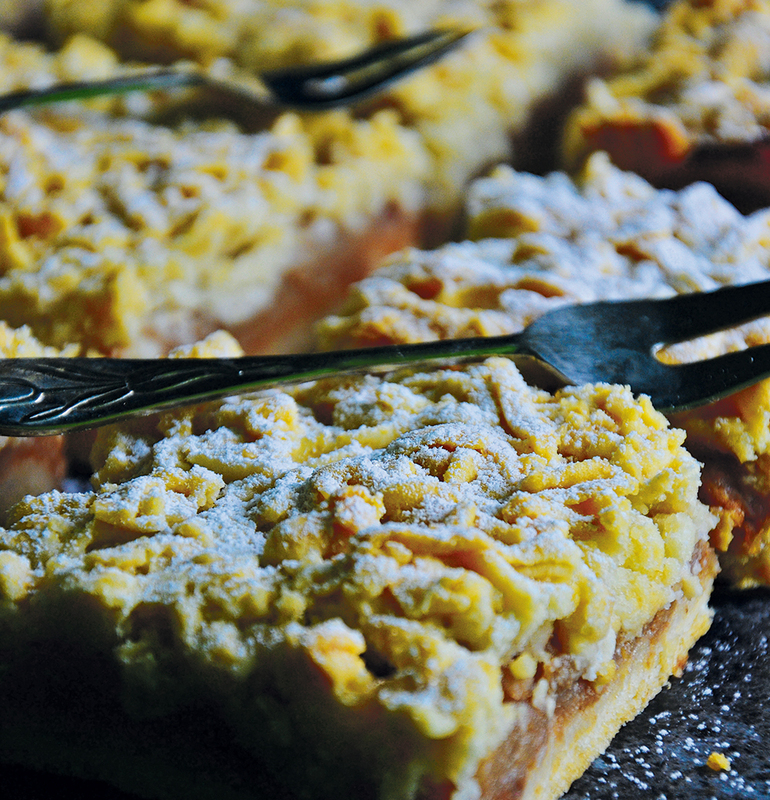 Mazurek is simply obligatory. We make two versions: on a grainy base without baking and baked on half-short pastry, always with aromatic chocolate cream, with millet groats, orange mousse, or good marmalade. 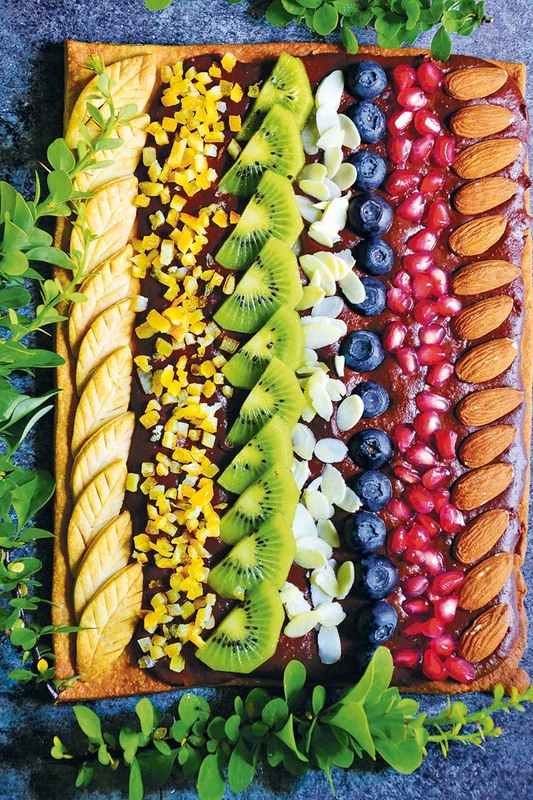 There has to be an abundance of ingredients on top, which must be spectacular and colourful. For the cream, unusual ingredients such as beans can be used. Mix flour, starch, and icing sugar. Add coconut oil and mix thoroughly. Slowly add water, mix after each tablespoon. The amount of water depends on the moistness of the flour. Knead well. The dough should resemble the dough for pierogis – it should be soft and elastic. Roll it out on a baking paper till it’s about 4–5 mm thick. Cut out a rectangle or other shape. Prick all over with fork. The rest of the dough can be used for decorations and gently pressed into the base (as shown on the picture). Put in a refrigerator for 30 minutes. Bake for 20 minutes at 190°C/375°F. Allow to cool. Blend the beans thoroughly with mint and syrup. Heat the juice and zest until boiling. Add chocolate and stir until it melts. Add blended beans and cinnamon and mix carefully. Spread the cream on the pastry and add the decorations. Put in the refrigerator until the cream thickens. 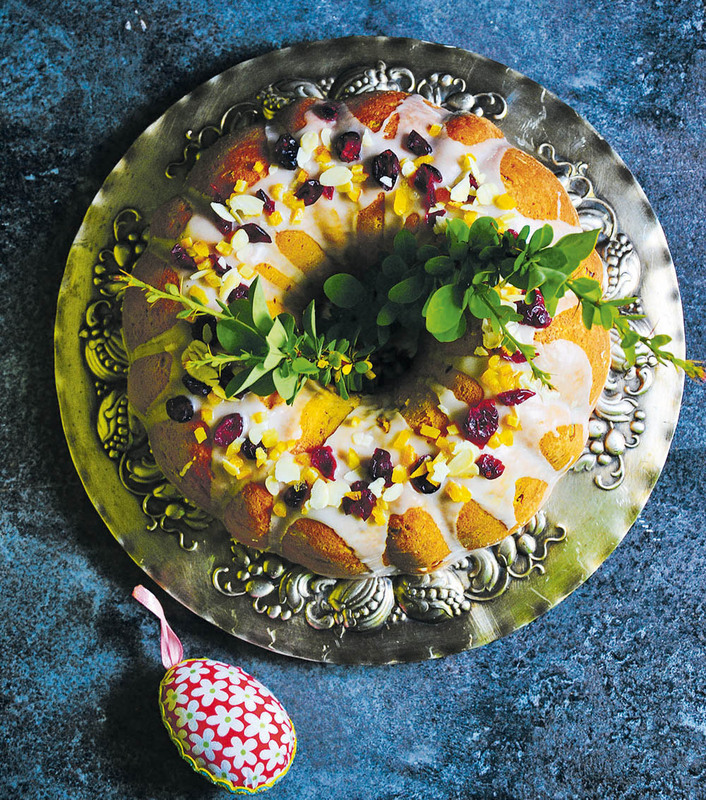 There is no Easter without yeast Bundt cake, mazurkis, and cheesecakes – they are obligatory. They are sometimes accompanied by pound cakes, marble cakes, saffron cakes, or orange cakes. My favourite is made of pumpkin. When it’s pumpkin season, I always bake, blend and freeze a lot of them. And I always store some for Easter, for the Bundt cake. Ideally it’s yellow and accompanied by ruby cranberries and sweet icing. Mix flour, yeast, sugar, and cranberry. Mix pumpkin mousse, milk, lemon juice and zest, and coconut oil and heat gently. Add to the dry ingredients and knead. This should take more or less 8 minutes. Grease the Bundt cake form with oil and sprinkle with a thin layer of flour. Put in the dough, cover it and put aside for 1 hour in a warm place to rise. Bake for around 35 minutes at 180°C/350°F (until a wooden skewer comes out clean). Can you eat cream rolls every day after school? If you’re me, you surely can. I used to visit a confectionery almost every day. My obligatory set included: a cream roll, a bajaderka, or a muffin with pudding. Actually, that was all I could choose from. Crispy, buttery, and melt-in-the-mouth. Is there a vegan version? Certainly, here’s my recipe. Knead all the ingredients until the dough is smooth. Roll the dough out till it’s 2–3 mm thick. Cut into strips 1 cm wide. The length depends on the length of the baking tubes used. Wind the strips around the tubes so that the dough slightly overlaps. Put into a refrigerator for 10 minutes. Place the rolls on baking paper. Bake for 15 minutes at 200°C/400°F. Cool down gently and take them off the cornets. Repeat until you run out of dough. Take out the white solid part of the coconut milk from the cans. Beat well with icing sugar. Add vanilla extract and lemon zest and mix gently. Put the cream into a piping bag and fill the empty rolls. You can decorate them with fruit or sprinkle with icing sugar. When I was a child they used to be made at every home. Huge dry wafer sheets were stuffed with filling usually made from melted butter, cocoa, and dried milk, sometimes with jam (blackcurrant was the best). Round wafers were used to make pischinger (a kind of a small cake), which is best with melted chocolate and crushed nuts. 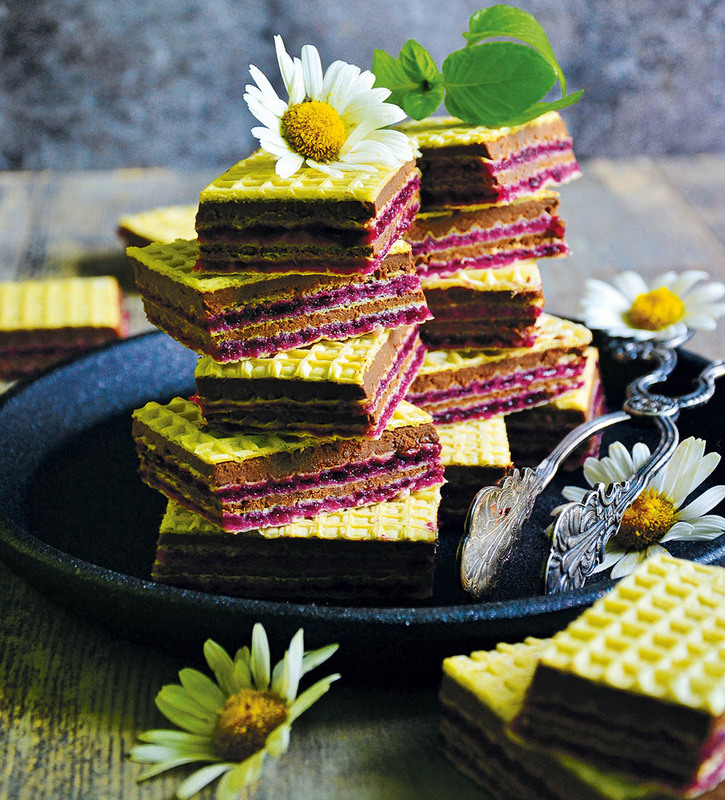 My version of wafers includes a chocolate cream made from chickpeas with blackcurrant jam. Take out the white solid part of coconut milk from the can. Put it in a pan and bring to the boil. Turn the heat off, add chocolate, cocoa, vanilla extract and sugar. Stir until all ingredients melt. Add the chickpea and blend thoroughly. Put the wafer sheet on a wooden board. Smear half of the cream on it and cover with the other wafer. Smear it with half of the jam. Repeat until you have used all the cream, jam and wafer sheets. Press gently. Put in a refrigerator for 4–5 hours to set. All cakes with apples have a special place in my heart. I make them most often in autumn and winter, with spices, of course. The best apples for apple pies are antonówka and szara reneta, which are slightly acidic and aromatic. I have one special recipe. I use it at Easter and Christmas: apple slices with raisins and walnuts on shortcrust pastry. I strongly advise making a double serving because it tends to disappear quickly. Carefully mix flour, starch, icing sugar, and coconut oil. Add one tablespoon of water at a time and after each one mix or knead the dough. When all the ingredients have been combined, knead until the dough is elastic and smooth. Divide the dough into two identical parts. Roll one of them out on a 20 x 30 cm/ 8 x 12 inch baking paper sheet. Prick the dough with a fork several times, put on a baking tray and leave in the fridge for 30 minutes. Put the other part of the dough in the freezer for 45 minutes. Put the tray out of the fridge and bake 15 minutes at 190°C. Cool down. In the meantime prepare the apples. Peel the apples, cut out apple cores. Slice on a grater or a mandoline slicer. Mix with cinnamon, raisins and thickly chopped walnuts. If the apples are too acidic, you can add sugar. Put the breadcrumbs on the half-baked base and distribute evenly. Then spread the apples on the pastry. Grate the frozen dough onto the apples. Bake for 1 hour at 180°C/350°F. The time right before Christmas is always a busy period. 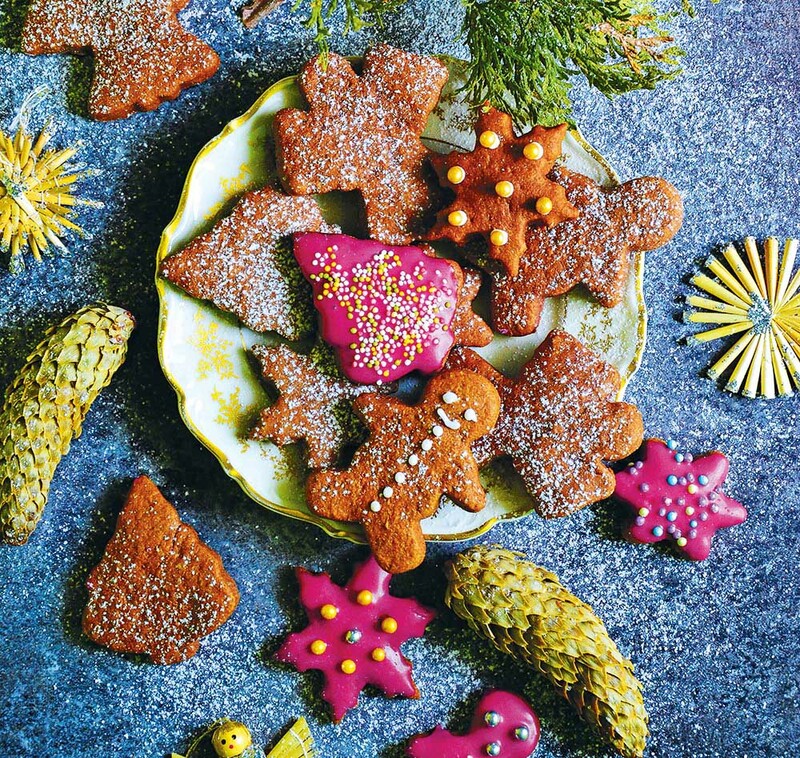 I need to make around 500 gingerbread biscuits with decorations and icing. Why do I go crazy like this? Because later I wrap them in foil with spruce twigs and nuts to make annual presents for my relatives. They come in many versions: pumpkin, potato, gluten-free with chickpea and millet flour or green with chlorella. The potato ones are still soft even a couple of days after baking. They harden with time. I love them because they are moist inside. Cook the potatoes until soft, cool down and pass through a potato ricer. Mix with date syrup and coconut oil. Mix flour, starch, baking soda, and gingerbread seasoning in another bowl. Add liquids and knead the dough. Dust a pastry board or a pastry mat with flour, roll the dough out till it’s more or less 5 mm thick. Cut out different shapes using biscuit cutters. Bake for 10 minutes at 170°C/325°F. Cool and decorate as you wish. If you’d like more information about Paweł Ochman’s original Polish recipe book, you can find it on Znak Publishing House’s website.